A Victorian Claret Jug decorated with fairies, insects and flowers, London 1873. The English love of claret can be blamed on Henry II who married Queen Eleanor of Aquitaine in 1152. Part of Eleanor's Kingdom included the vineyards of Bordeaux and it wasn't long before the best red wine in the world was being shipped to England. Not only did this prove the death knell for the huge number of English wine grower's but it also turned them into "a nation of shopkeepers". Claret continued in popularity and demand up until the latter part of the 18th century, when circumstances changed in France and they decided to have a revolution followed by years of Napoleon. During this period, the importation of claret declined and finally ceased, bar a small amount imported by a few entrepreneurs better known as smugglers! In 1860, the re-importation of claret commenced with reduced duty payed on the wine to encourage trade between France and England. Once again, claret took its rightful place as England's premier alcoholic beverage. 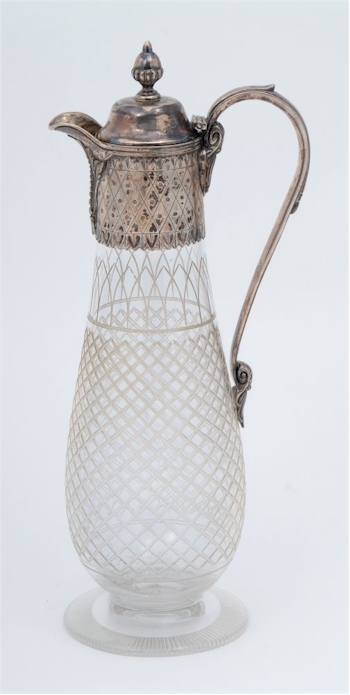 A Victorian claret jug of slender form this time with plain cut lattice decoration to the body, Birmingham, 1864. A Victorian claret jug this jug is decorated with cranes, birds and insects beside a reed filler pond, Sheffield, 1878. Despite looking more modern in design it is in fact Victorian, London, 1889. 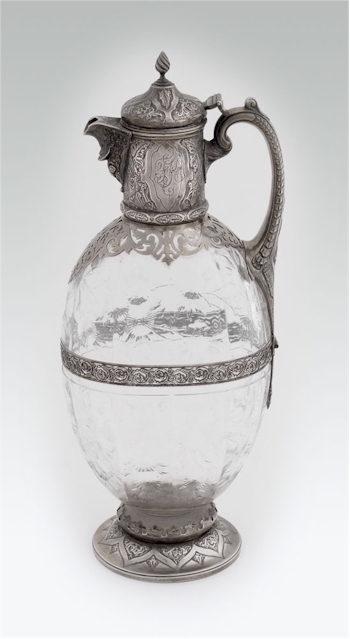 A late Victorian claret jug with cut decoration to the body, bacchanalian decorated collar and lion and shield finial, London, 1897. With the resurgence of claret in the late 19th century, not only was it taken up with vigour by the upper classes but also by the wealthier middle classes. Coinciding with this was the rise in the formal banquets and dinner parties, together with all the etiquette that came with them. 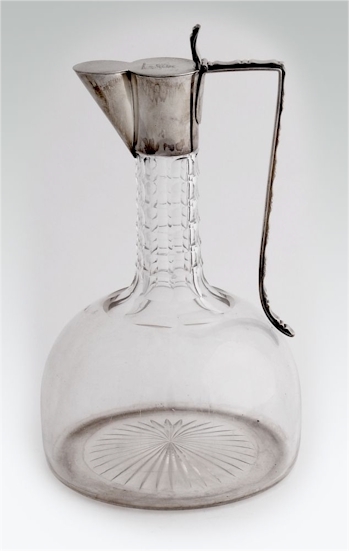 Rather than just have opened bottles on the table, a jug was used to hold the wine and so the claret jug was born. The end of the 19th century also coincided with vintage years for claret in 1894, 1896, 1899 and 1900. 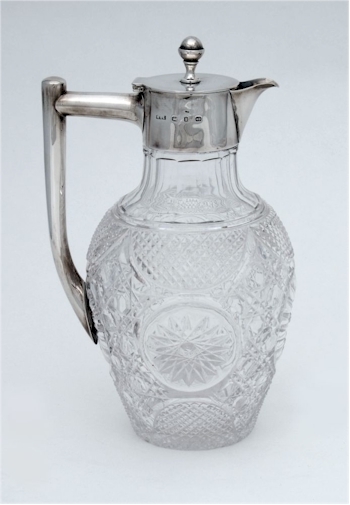 The claret jug normally came with a clear glass body that would show off the colour of the claret to be drunk. 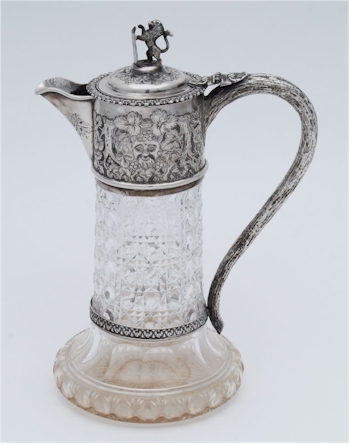 It would have a silver mounted collar to the neck of the jug with a scroll shaped handle and, of course, the hinged lid. 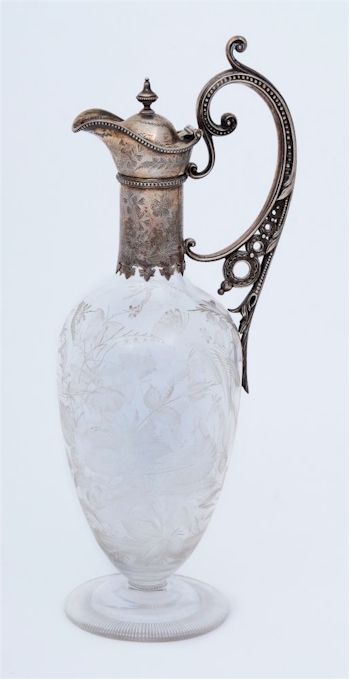 A Victorian silver gilt claret jug, of oval form heavily chased with scrolls and foliage, London, 1886. 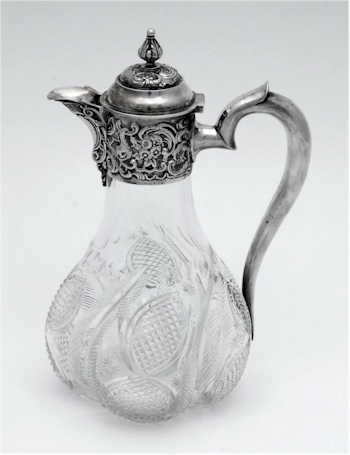 A simpler Edwardian claret jug with simple engraved decoration, London, 1901. An Art Deco period claret jug with flat lid and angular handle. 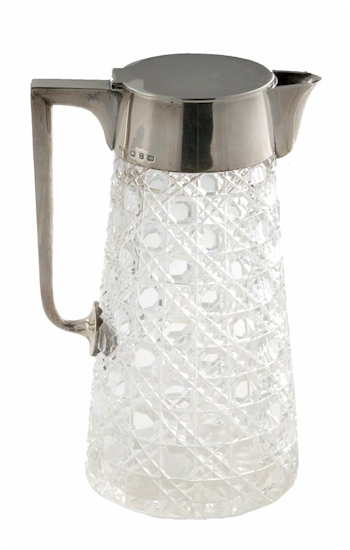 The glass body had several variations in decoration from plain and clear translucent to cut designs, which included the hob nail, palmette and starburst designs. Sometimes the glass would be engraved with traditional English subjects such as stag hunting or fox hunting. The silver mounts would also reflect the latest fashion trends from the traditional bacchanalian scenes of putti, vine leaves and grapes to a more simple scroll and foliate bordered decoration. Often the finial to the hinged lid would be in the form of a lion or stag holding a shield onto which the owner would have his crest or monogram engraved. 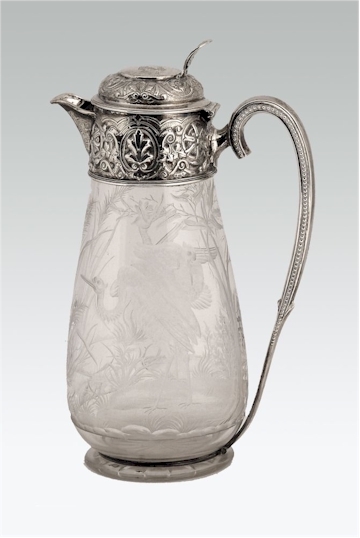 As we move from the Edwardian period towards the Art Deco, once again the claret jug adapted its decoration: the glass body was plain, cylindrical and tapering, lids tended to be flat rather than domed and the handles angular rather than scrolled. Since the 1930s, claret has again fallen out of favour due to individual vineyards in Bordeaux producing fine wines that people now collect and drink under the vineyards label. These include Chateau Laflite, Chateau Latour and Chateau Mouton-Rothschild. Perhaps it is a greater awareness of fine wines by the British that has in turn led to the demise of the ever collectable claret jug. The Silver Claret Jug was written on Wednesday, 1st March 2017.